Blogger provides a built-in stats monitoring tool that provides you the most comprehensive information about your visitors. It keeps track of your visitors and provides in-depth details about the total number of pageviews, the operating system they are using, the traffic source and etc. Since, it also tracks your pageviews, so it gets difficult to identify how many visitors or page views your site is serving. 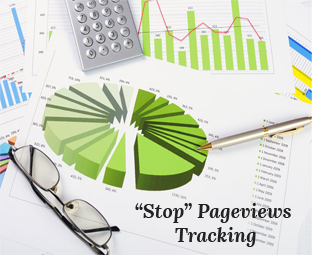 So, if you are looking to Stop Tracking your own Page views in Blogger Stats then in this article, we will show you How to Stop Tracking your own Pageviews in Blogger? Why you should Stop Tracking Your own Pageviews? As a website owner, you might visit your site more often may be 10 to 20 times a day and during the visit you might serve hundreds of pageviews yourself. Since, Blogger keeps track of all visitors it would also include your views in the traffic statistics. For that reason, you will be unable to know the real performance of your site. For instance, your site has 6000 views per day out of which 2000 views are yours, so the real visitors are just 4000. Now you can notice the foremost difference in your real traffic. The First thing you need to do is to Login into your Blogger account. After logging in, from the dashboard go to your site >> Stats >> Overview. 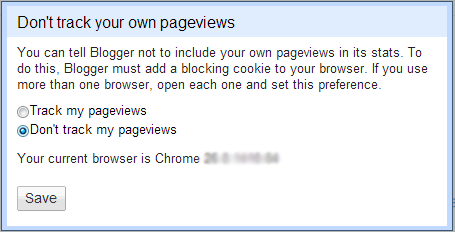 Now on the right side of your screen, just under the page views statistics select the “Don't track your own pageviews” link and proceed to the next step. A new window will pop out asking you whether you want to track your own pageviews or not. Now just check the box next to the “Don't track your own pageviews” and press the save button to finish the whole process. At this instant, Blogger would stop tracking your own views until or unless you clear your browser cookies or tried to access your site with different browsers. We hope this tip would help you in getting rid of your views from your site. However, you can also try Google Analytics for tracking because it is the most accurate tracking service. If anyone has a better tip for tracking visitors then, do not hesitate to leave your comment below. Nice and very informative post..
Nice tips syed bro we have turned off this options to know the exact and unique previews. It's my first visit on this blog and I'm much impressed with your quality content as well as unique design. keep always UP...!!! When I do this, it doesn't seem to make any difference. I save my preference, but then when I go back in, it's still the 'Track my page views' option which is checked, and I'm pretty sure it's still tracking my visits. Well, This is the reason why Always recommend you to use Google Analytics.. Its the most accurate stat checker! This does not work at all. A few weeks back I did an internet search and found that to make this work for Blogger or Anylitics it is more complicated ... and my pageviews are thusly still being tracked. Dear Editor i want to know about Google analytic show me the 100- visitors traffic on my blog but other my hosting c-panl show the 350 visitors which one is right. Google Analytics is the most comprehensive Tool. You should Trust it. Thanks for the help. I was wondering if they tracked my own views or not. Yup .. It is because of the Cookies protection option turned on in your browser settings. To overcome, you go to Cookies > Manage Exceptions settings and add your blog URL to the exception list. Sign off and sign in back to your blogger account and your "Track my page viewS" options should have changed. Thank you very much. I didn't knew it. I would prefer you to use Google Analytics.